“The Yaqui River is a structural part of our life and with this theft of our water, they are condemning us to death as a people,” said Mario Luna, secretary of the traditional authorities of the Yaqui tribe, warning that his people are facing the greatest ever threat to their existence: the dispossession of the waters that give them economic and cultural sustenance. The ancestral home of the indigenous Yaqui People is the valley of the Yaqui River, in the state of Sonora in northern Mexico, and the river is their ancestral source of water for drinking, irrigation, and ceremonial purposes. In 2010 the governor of Sonora, Guillermo Padres Elias, announced the construction of the “Independence Aqueduct”, which would extract 75 million cubic metres of water per year from the Yaqui River and carry it 108 miles to the Sonoran capital city of Hermosillo. It is estimated that forty percent of the drinking water in Hermosillo is currently wasted, and the water is destined for industries with high water demands, such as the recently installed Heineken, Ford and Big Cola plants. 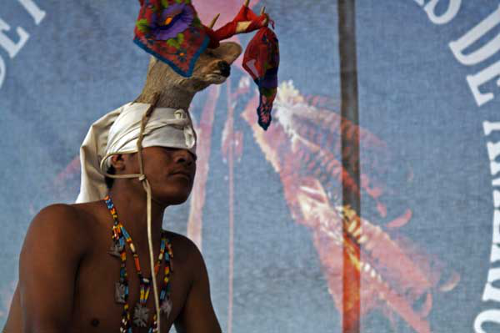 The Yaqui people see themselves as the stewards and guardians of the river, but they were not consulted about this project, in clear violation of their rights to free, prior and informed consent, as well as their rights to autonomy and self-determination as indigenous peoples – all laid out in treaties and conventions signed by the Mexican government. The tribe therefore went to court and on May 28, 2012 gained an injunction in the Supreme Court of Justice of the Nation saying that the Sonoran government must stop the extraction of water. The Supreme Court ratified this decision on May 8, 2013 saying the rights of the Yaqui people to consultation had been violated. Nevertheless, the work has not stopped, two of the five pumps which make up the aqueduct remain active, and the extraction (or theft) of water from the El Novillo dam on the Yaqui River continues. The Yaqui say that there is now no water flowing in the river, and they have no water for human consumption, no means to survive in the desert. They cannot grow their crops, because they have no water for irrigation. Sea water is entering the river, causing salinization of farming lands and water supplies. People are becoming ill, the situation is extremely serious, and the whole future of the Yaqui nation is in jeopardy because their most basic and precious resource, the basis of life, is being taken from them. Following this, at the beginning of August, the Network for Solidarity and against Repression convoked the national and international campaign Namakasia: for the life of the Yaqui Nation, “with the objectives of supporting the fight to stop the theft of the water which belongs to the Yaqui tribe, strengthening the autonomous projects of the Yaqui nation, and spreading the word and the news coming from the traditional authority of the Yaqui Nation.”(3) Namakasia is a Yaqui word representing the dignified struggle of now, and of the ancestors, and that the people should stay strong, living autonomy every day and defending it every moment. It brings all the Yaqui people together under one flag. 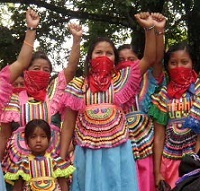 The campaign held a national and international day of solidarity with the Yaqui tribe on August 30, 2013, with forums and protests held in Mexico City. around 500 years ago, so the area truly represents their ancestral land and territory. They have throughout their history been interconnected with the Yaqui River, not only for their economic survival, but also for their cultural integrity upheld through their stewardship of the river and its waters. The construction of the aqueduct has implications at all levels of their lives: environmental, economic, ecological, health, social, cultural, religious, and ultimately implications for their very survival.